" This is the best CPAP machine. I love it and love the fact that I can keep track of my usage on iPhone app. " " I have been very pleased with the easy use of this AirSense 10. It is also very quiet! And stylish too! I strongly recommend this product for all the ladies. " Try the AirSense™ 10 for Her risk-free for 30 Days! If you're dissatisfied in any way, you can return the machine to CPAP.com for a full refund. The AirSense™ 10 AutoSet for Her CPAP Machine with HumidAir™ Heated Humidifier is the first CPAP machine truly designed for women on the outside AND inside. An advanced algorithm designed for female breathing patterns helps make therapy as comfortable and effective as possible. The sleek design features an integrated humidifier making it 23% lighter than former models from ResMed. 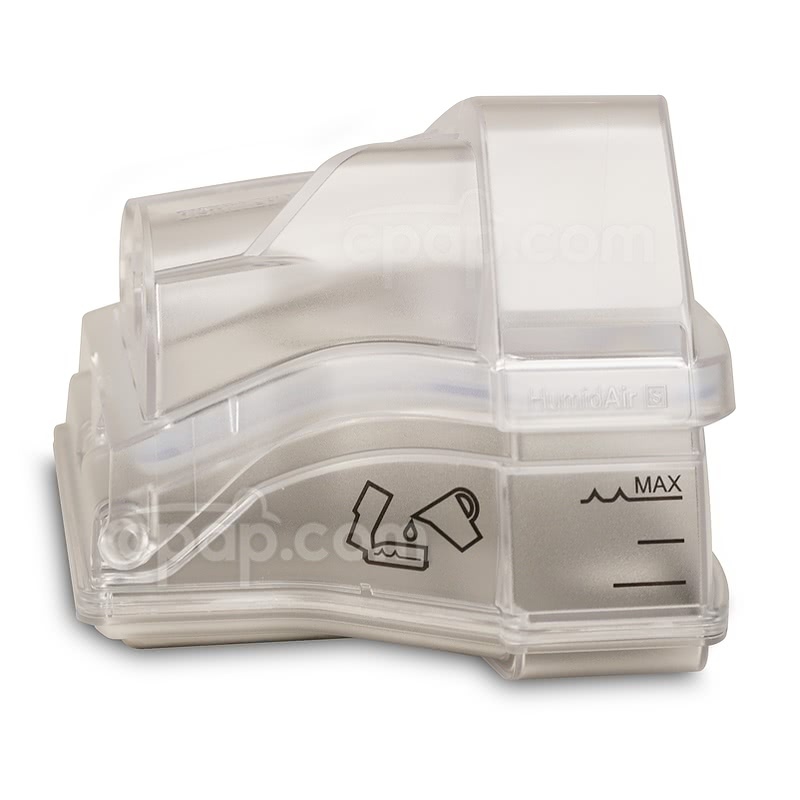 25% of AutoCPAP Machine product buyers choose this product. Now offering FREE returns on the AirSense™ 10 for Her. As long as it's returned within 30 days of the original purchase, the AirSense 10 for Her can be tried completely risk-free! This allows for the return of the machine for any reason, no questions asked. It's a great way to test out the machine and see if it's a good fit. 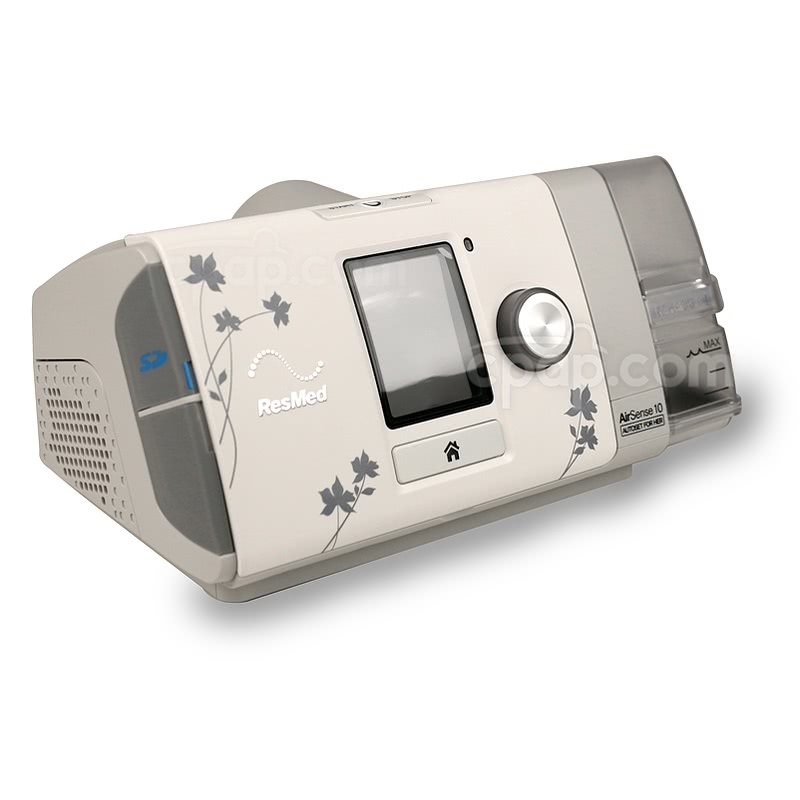 The AirSense™ 10 AutoSet for Her CPAP Machine with HumidAir™ Heated Humidifier is designed with women in mind. From the ivy leaf design to its special algorithm, this machine is a woman's dream. 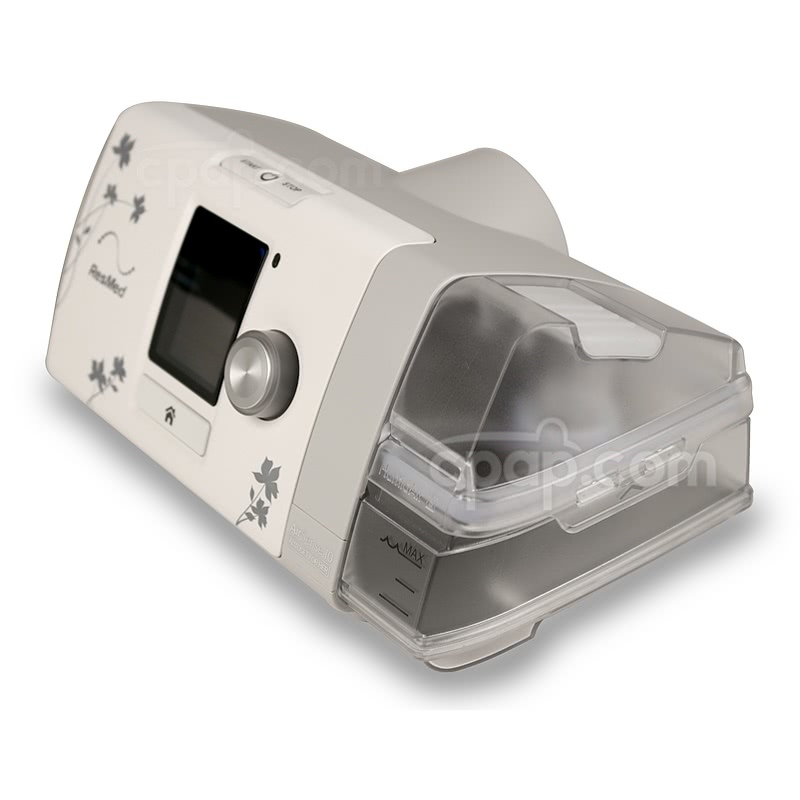 This is a auto-adjusting CPAP machine that auto-adjusts to the optimum pressure on a breath by breath basis. 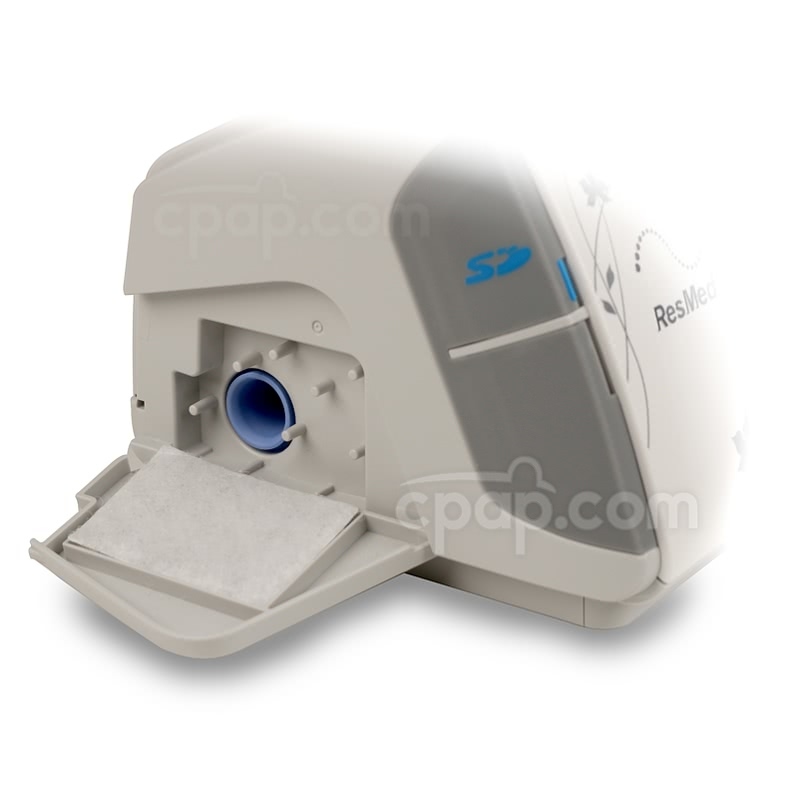 Also available from ResMed is the AirSense™ 10 AutoSet CPAP Machine with HumidAir™ Heated Humidifier. It offers only the standard AutoSet™ for auto-adjusting the delivered pressure in a black machine. All other features are the same as the For Her version. 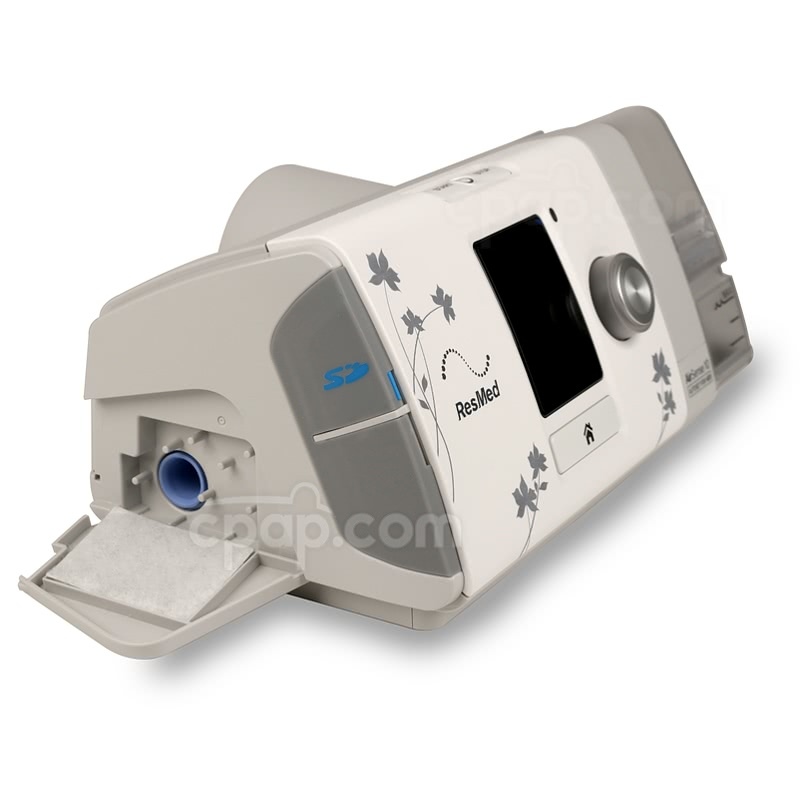 The AirSense™ 10 AutoAdjust for Her CPAP Machine has an internal heating plate. The water chamber is attached directly to the machine for a minimal footprint. The humidifier can be set to 9 different settings: off, and 1 through 8 with 1 being the lowest level of humidification, and 8 being the highest. Enjoy enhanced humidification by adding the OPTIONAL ClimateLineAir integrated heated tube. The Auto Climate Control mode will consider the room temperature and adjust the level of humidification delivered to the mask. The LCD display of the AirSense™ 10 AutoSet for Her features vibrant colors to help clearly identify different stages of therapy. A blank circle fills with green as therapy pressure ramps up. Green and red faces indicate proper or poor mask fit and are also used to indicate if the humidifier is working properly. The machine also features an integrated light sensor which allows the screen to adjust brightness automatically when ambient light changes. If a restroom break is needed in the middle of the night, the screen won't blind with brightness, and in the morning it won't be too dim to read how therapy went. In addition, the screen will automatically turn off after a short time to avoid extra light in a dark room. Autoset Response is a comfort feature that can be enabled to provide more gentle pressure increases. If the machine detects a pressure increase is needed, the response feature will ease into the increased pressure to help those with lower pressure tolerance. The chamber should be taken apart and hand washed weekly using warm water and a mild detergent. It should be rinsed well and allowed to air dry out of direct sunlight before reassembling. The chamber should not be washed in a dishwasher or washing machine. The SlimLine hose should be washed in the same manner and allowed to completely dry out of direct sunlight before reattaching to the machine and mask. The user manual included with this machine can be viewed and downloaded here: AirSense 10 User Guide. 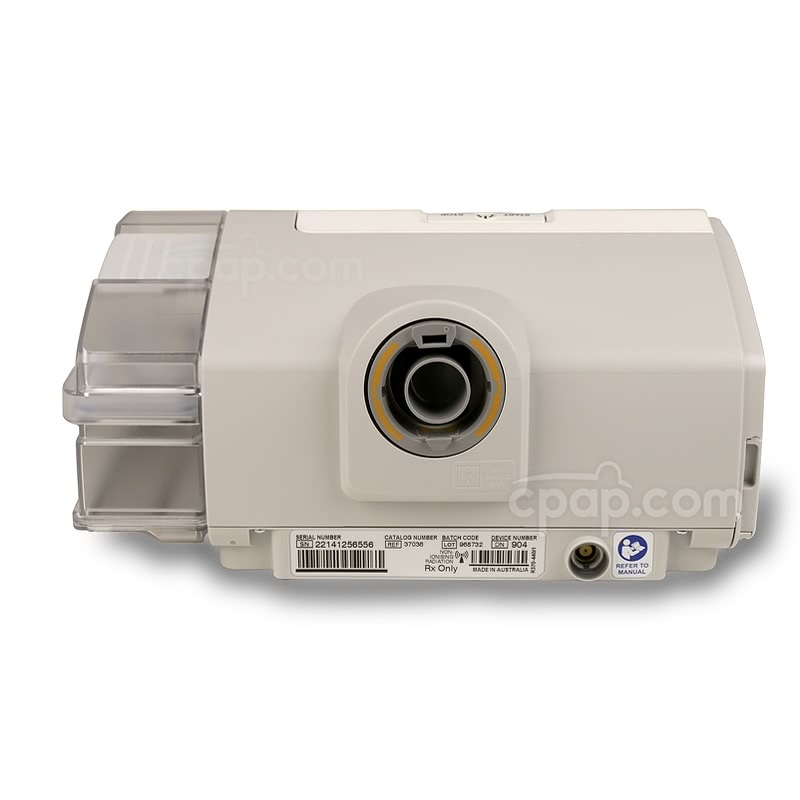 FAA Compliance Letter: To view the FAA compliance letter for the AirSense™ 10 AutoSet For Her CPAP Machine with HumidAir™ Heated Humidifier, click here. Do not fill the water chamber past the max fill line as this could result in water entering and damaging the device. Allow the water chamber to cool for ten minutes after use before handling as it could be too hot to the touch. The machine will display a blue snowflake in the upper right of the screen while cooling is taking place. The water chamber should be washed weekly using warm water and a mild detergent, rinsed well, and allowed to dry out of direct sunlight. The standard water chamber included is not dishwasher safe and should only be hand washed. To view a dishwasher safe chamber, see the Dishwasher Safe Water Chamber for AirSense™ 10 Humidair™ Heated Humidifier. If the integrated heated humidifier is not being used, purchase the Side Cover for AirSense™ 10, AirStart™ 10, and AirCurve™ 10 Machines separately in order to enclose the machine opening. The side cover is not needed to operate the machine. How to Determine if the Water Chamber is Dishwasher Safe? AirSense™ 10 and AirCurve™ 10 machines denote the water chamber model with an "S" or "C" label. Look directly above the maximum fill line located on the side of the chamber to find the word HumidAir™ and the corresponding letter embossed into the tank. If the water chamber is dishwasher safe, the chamber will appear as HumidAir C, which represents a cleanable tank. If the water chamber is the standard model, the chamber will appear as HumidAir S, which represents a standard tank. Either a 15mm (Slim) hose or a 22mm (Standard) hose may be used with the AirSense™ 10 line of machines. The machine must be changed to the proper setting to ensure accurate therapy pressure. Also available is the OPTIONAL ClimateLineAir™ heated hose which will instantly activate the Auto Climate Control feature when connected to the machine. 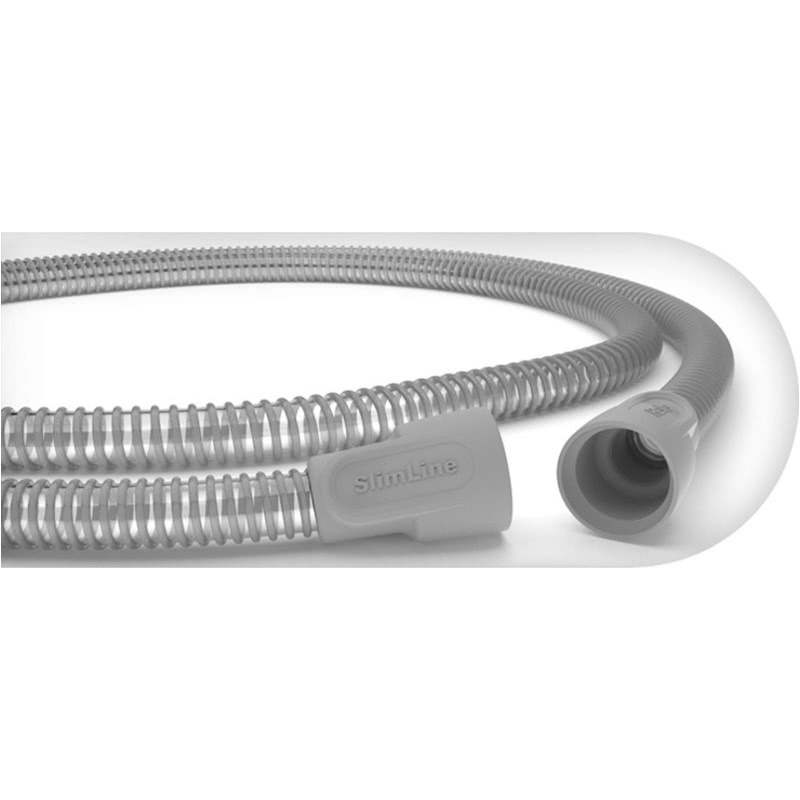 A SlimLine™ hose is included with the purchase of the AirSense™ AutoSet for Her CPAP machine. The hose is found in the interior, zipped compartment of the travel bag. The nook is located just below the floral print pockets providing safe keeping for the hose during travel. While the tube brush can certainly be used to clean the ClimateLine hoses, it's not able to make the 90-degree turn at the machine connection end and will be unable to clean the entire ClimateLine hose. The tube brush is fully compatible with all other hose models. 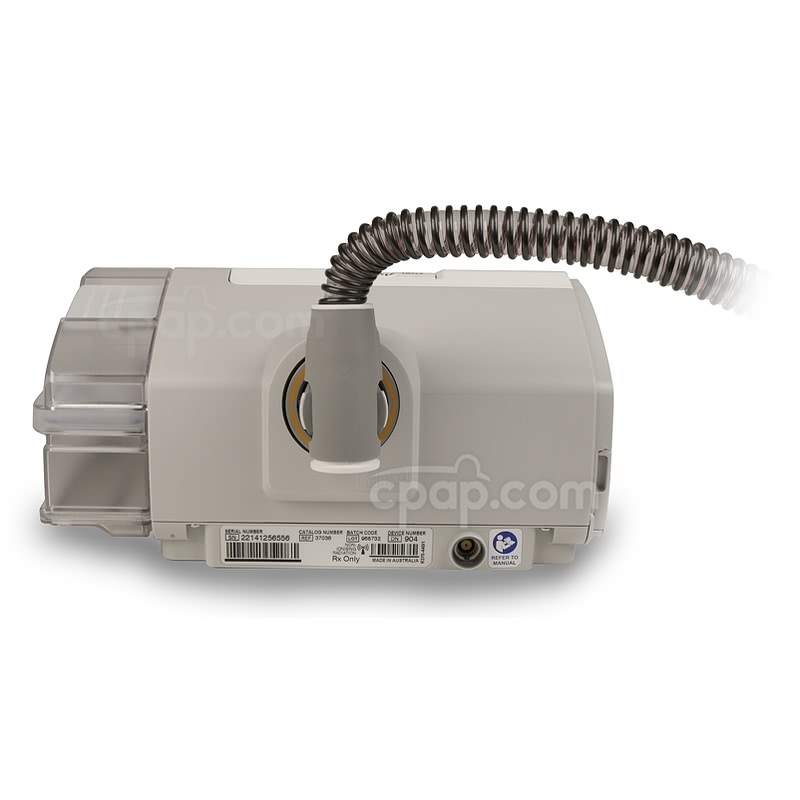 The AirSense™ 10 CPAP machines feature AutoRamp™ technology. Unlike traditional ramp features that will slowly ramp up pressure over a set amount of time, AutoRamp™ will stay at the set starting pressure until it senses the user is asleep. The default starting pressure is 4 cm H2O. Once the user is asleep, it will then start ramping 1 cm H2O per minute until it reaches the full prescribed pressure. AutoRamp™ will always reach the full prescribed pressure within 30 minutes, so even if not asleep, the machine will start to ramp in 1 cm H2O increments every minute to reach the full prescribed pressure at the 30 minute mark. 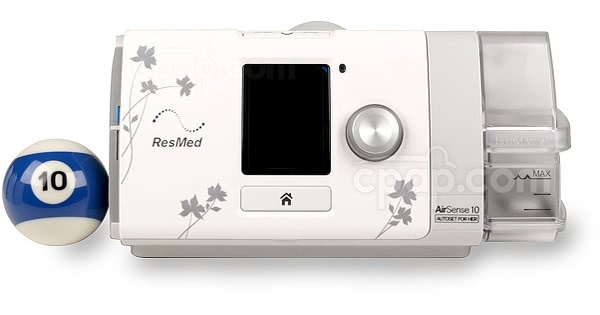 Additionally, the AirSense 10 CPAP machines can be set to a traditional ramp if needed, or turned off altogether. Per the manufacturer, the SmartStart™ technology may not function as intended when used with a nasal pillow mask and a pressure setting of 7 cm H2O or less. If the feature does not appear to be functioning, this comfort feature can be turned off. Please refer to the User Guide for more information. Please note, the AirSense Line of machines include a built in wireless modem giving the machine data transfer capabilities over a wireless cellular network. The wireless modem will automatically connect if the machine's "Airplane Mode" is turned to "Off". 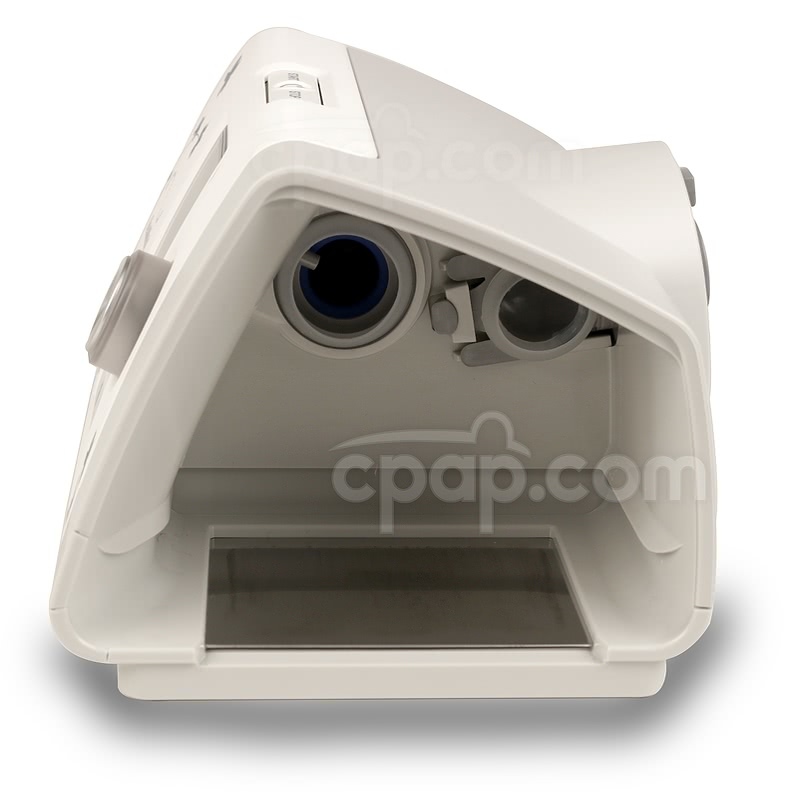 For privacy concerns, CPAP.com will ship the machine with airplane mode "On" so that sleep data information will not be transmitted unintentionally over the wireless network. If Airplane mode is turned "Off", sleep data could be transmitted to ResMed's servers. PLEASE NOTE: The AirView data transfer system is for use only in North America. It cannot be used to transmit data wirelessly outside of North America. The SD card that accompanies the machine can be used to store and share data. The included SD card comes installed in the machine ready to use. While looking at the machine with the display facing forward, the SD card is located under the upper flap with the blue "SD" logo on the left side of the machine. 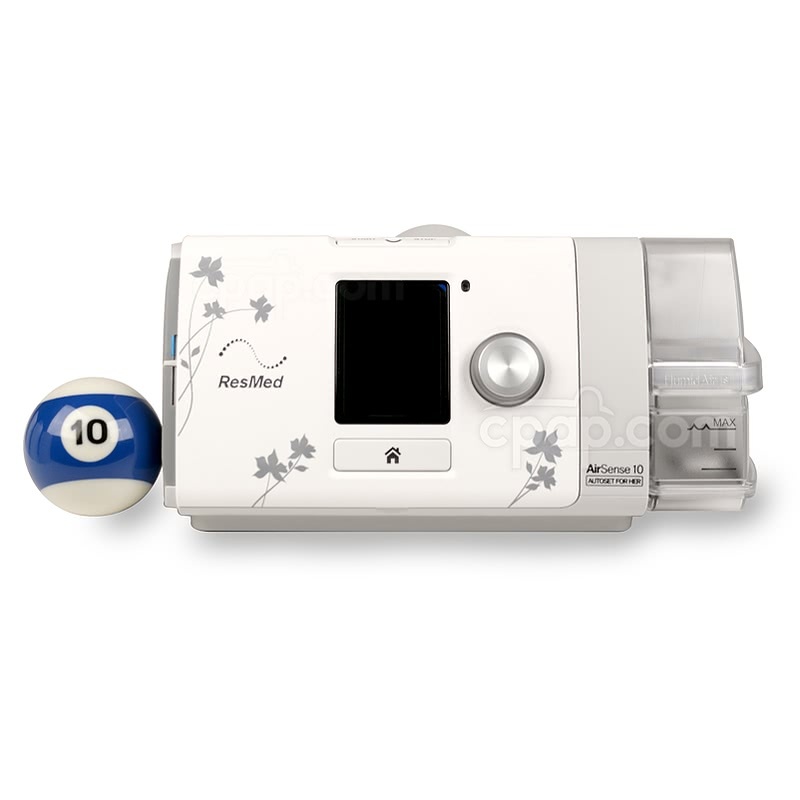 ResMed AirSense 10 CPAP Machine with HumidAir™ Heated Humidifier: Single pressure CPAP machine with included HumidAir Humidifier. 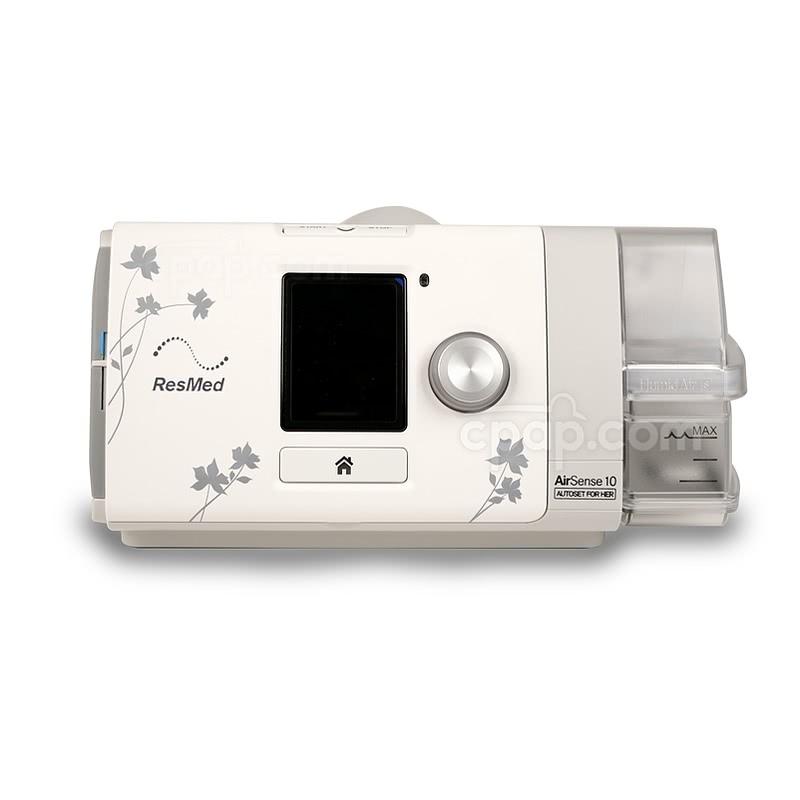 Can be set only in CPAP mode and CPAP mode with EPR. Compliance sleep data along with AHI. Only available in black. AirSense 10 Elite CPAP Machine with HumidAir™ Heated Humidifier: Single pressure CPAP machine with included HumidAir Humidifier. 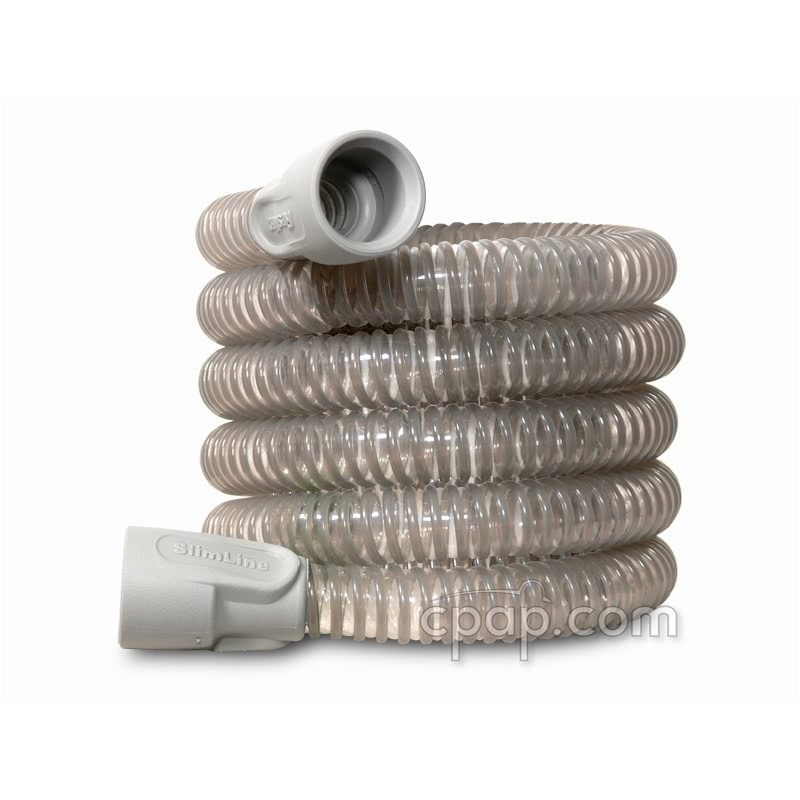 Can be set only in CPAP mode and CPAP mode with EPR. Compliance sleep data plus advanced data on the screen. Only available in black. 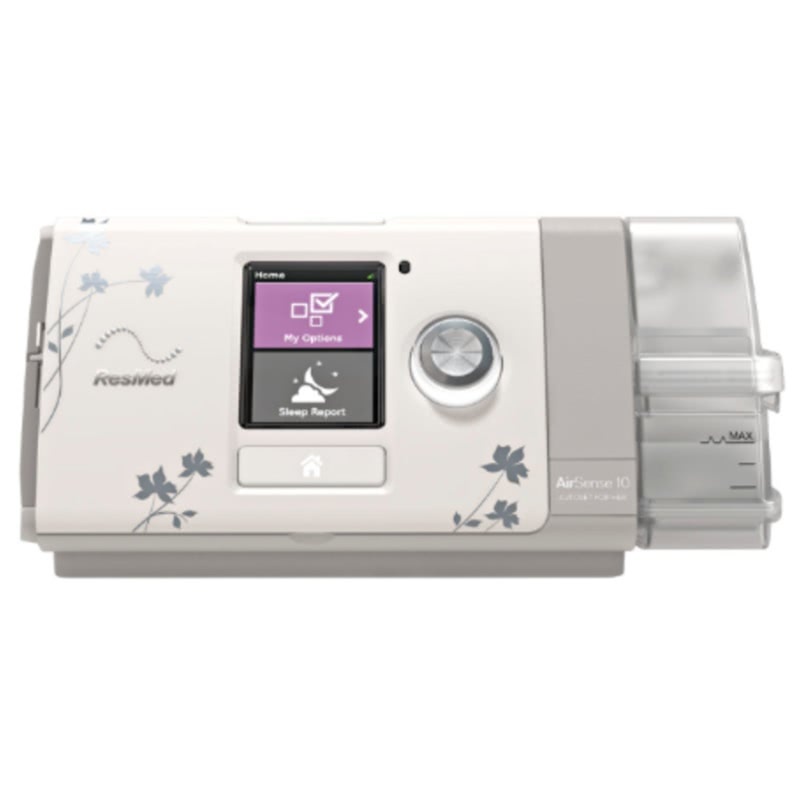 AirSense 10 AutoSet CPAP Machine with HumidAir™ Heated Humidifier: Auto-adjusting CPAP machine with standard AutoSet algorithm with included HumidAir Humidifier. Can be set in Auto mode with standard AutoSet algorithm, Auto mode with standard AutoSet algorithm with EPR, CPAP mode and CPAP mode with EPR. Only the standard AutoSet algorithm is available on this machine. Compliance sleep data plus advanced data on the screen. Only available in black. 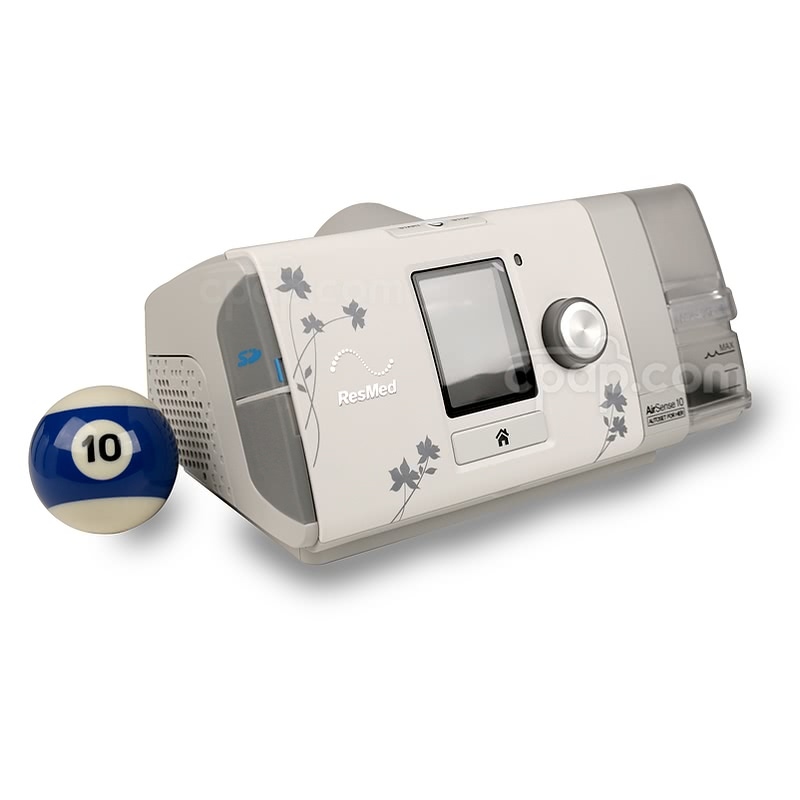 AirSense 10 AutoSet for Her CPAP Machine with HumidAir™ Heated Humidifier: Auto-adjusting CPAP machine with standard AutoSet algorithm with included HumidAir Humidifier. Can be set in AutoSet For Her algorithm OR standard AutoSet algorithm , Auto mode, Auto mode with EPR, CPAP mode and CPAP mode with EPR. Compliance sleep data plus advanced data on the screen. Only available in white. For a detailed chart outlining the differences between machines in the AirSense 10 series, please click here. The following information is applicable for the ResMed AirSense™ 10 AutoSet For Her CPAP Machine with or without the humidifier turned on. Keep in mind that using the heated humidifier will reduce the run time of a battery by approximately half. DC capable: Use the DC Converter 24V 90W For AirSense™ 10 and AirCurve™ 10 Machines to operate the AirSense™ 10 AutoSet For Her from a DC power source (battery). ResMed Power Station II Battery Kit for AirSense™ 10 & AirCurve™ 10 CPAP Machines: Use this complete kit including: the lithium-ion battery, the compatible DC cable, and the PSU adapter to power a ResMed AirSense™ 10 or AirCurve™ 10 machine when AC power is not available. Freedom Travel Battery Pack for CPAP Machines: Use the AirSense™ 10 and AirCurve™ 10 Machine 24V Power Converter for Freedom Travel Battery Pack to connect to the Freedom Battery. The Freedom is a lightweight lithium ion battery. AirSense™ 10 and AirCurve™ 10 Machine 24V Power Converter for Freedom Travel Battery Pack: This converter is necessary for using the Freedom Travel Battery Pack for CPAP machines with ResMed AirSense™ 10 and AirCurve™ 10 machines. Medistrom Pilot 24-Lite This lightweight Lithium-Ion battery is quickly emerging as the best way to power the ResMed AirSense 10, as it doesn't need an inverter to power the machine. It also comes with the cable needed to make the connection between devices, so there's nothing extra to buy. Failure to use the ResMed DC Converter 24V 90W For AirSense™ 10 and AirCurve™ 10 Machines can damage the machines. The Medistrom Pilot 24-Lite is quickly becoming the best way to power the AirSense 10 off-the-grid. Great for camping, flying, or any activity away from an outlet, this lightweight battery easily connects to the AirSense 10, without needing to use an inverter or other equipment. 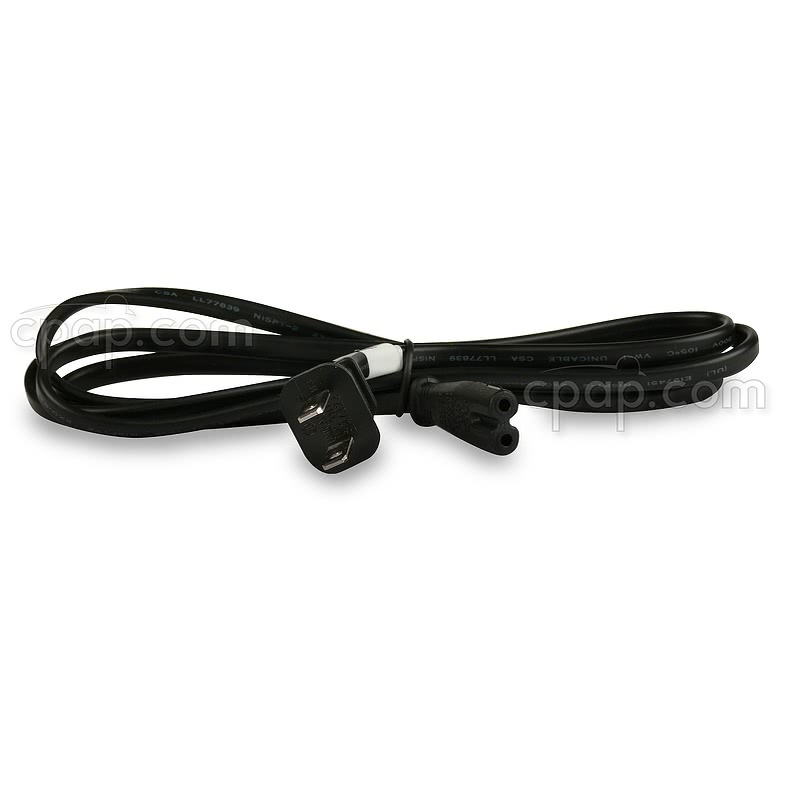 The required cable needed to connect to the AirSense 10 is included, and there's nothing else to buy. This battery kit includes a fast-charging lithium ion battery designed to charge 95% of the battery in less than four hours. The battery is designed to alert the user when the battery is low by sending a visual and audible alert to the charge display on the RPS II. To have double the run time, add a second RPS Battery Cell. Please Note: The Battery Coupler Kit for ResMed Power Station (RPS) II is needed to connect the batteries. 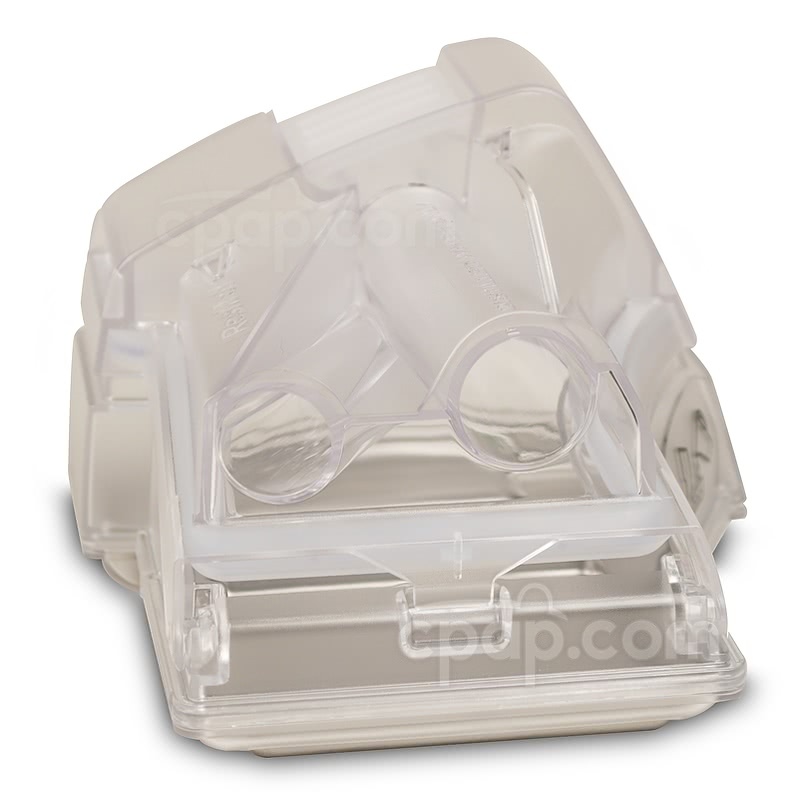 The PSU Adapter for the ResMed AirSense™ 10 and AirCurve™ 10 Series is included in this kit. 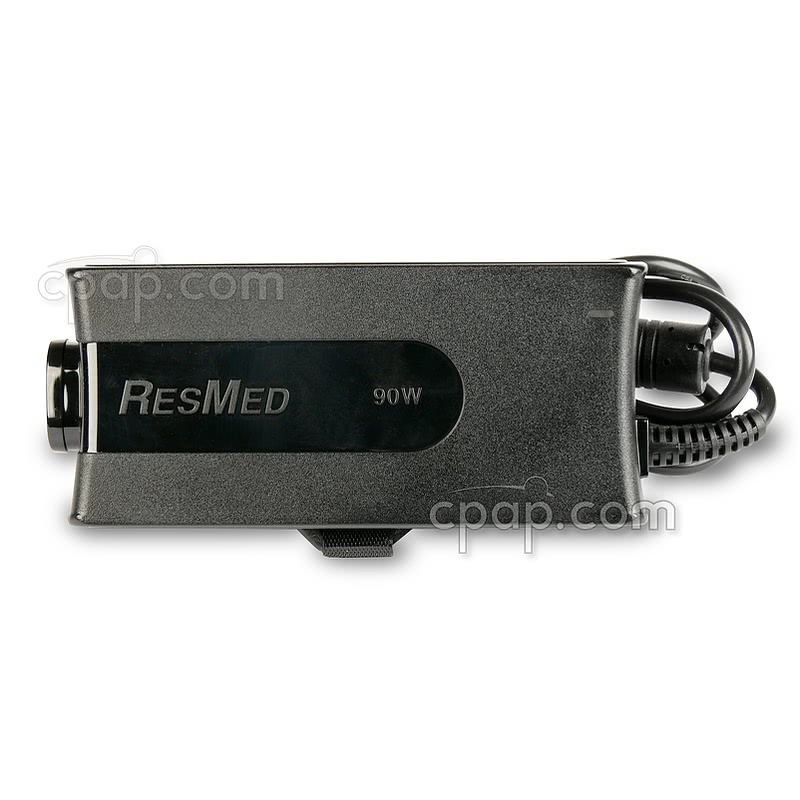 Use the adapter to charge the battery with the External 90 Watt Power Supply for ResMed AirSense™ 10 and AirCurve™ 10 Series CPAP and BiPAP Machines. The RPS II Battery Kit for AirSense 10™ and AirCurve™ 10 machines comes with a carry bag. When using the double configuration, the bag will hold an additional battery cell. 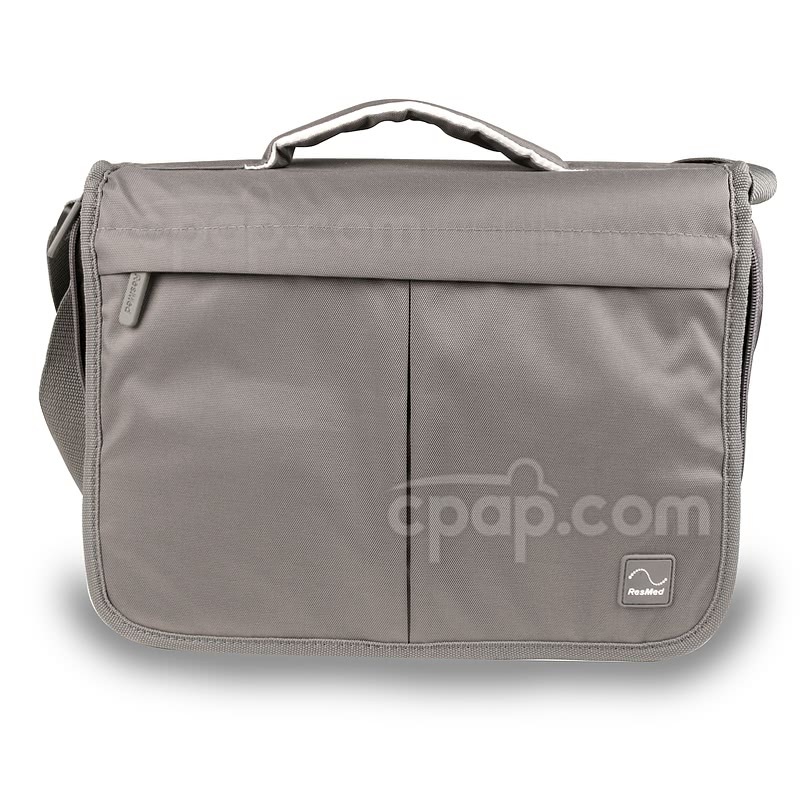 An access panel designed into the bag, allows the battery to be charged or used while it is inside the travel bag. The Freedom Travel Battery Pack is a lightweight lithium ion battery. Combined with the ResMed DC Converter 24V 90W For AirSense™ 10 and AirCurve™ 10 Machines it can be used as a great travel power companion for the AirSense™ CPAP Machine. 150W Modified Sine Wave Inverter Compatibility: The 150W inverter combined with the Freedom Travel Battery Pack will provide an AC outlet to plug the AirSense machine into the Freedom battery, however will provide a very low run time. It is NOT ADVISED to use this inverter to power the Airsense machines with the Freedom battery. Use instead the 24V converter. Lead Acid Deep Cycle Batteries are the same type of batteries that can be used with cars and boats. These are lead acid batteries that CPAP.com does not sell. Lead Acid Deep Cycle batteries used to be the only portable power option for CPAP machines, but now there are many other batteries that work as well. Lead Acid Deep Cycle batteries are typically sold at auto parts stores.